When I was a kid, my interests included dinosaurs, ancient civilizations (Egypt, Greek, Maya), mythology, unexplained phenomena (Loch Ness monster, Bermuda Triangle, UFOs), astronomy, science fiction, and comic books. A typical boy's interests, except maybe the ancient civilizations and mythology part. I believe there was a link between these disparate interests. Namely, they took me beyond the commonplace, the standard, the everyday perspective on life. They revealed how limited our existence was compared to what it could be. Dinosaurs show the Earth could (and did) sustain an "alien" ecology devoid of mammals or "higher life forms" such as humans. That we exist is an artifact of a meteor impact, not a preordained plan. Civilizations such as Egypt or Maya show how our democratic and Judeo-Christian belief systems are arbitrary. The Egyptian culture lasted 3,000 years, so America has a long way to go before it can proclaim itself the "end of history." "Alien cultures" show that our core values (fairness, kindness, responsibility, etc.) are particular to one culture, not universal. It's possible to construct a society such as Spock's planet Vulcan, where values such as logic dominate the others. Although I had a Hopi/Zuni coloring book, made a "kachina" in summer school, and even drew a couple of pseudo-Indian super-costumes, I didn't have a strong interest in Native Americans. Like most people, I didn't know or think much about them. I imagined they were all pretty similar, with a vague belief in a "Great Spirit," slowly vanishing "out there" in the desert somewhere. As I grew older, I became more interested in real-world political, social, and economic issues. They were infused with what I'd call a dawning multicultural perspective. This perspective was bolstered by lessons learned from history: that the Mongol empire controlled 2/3 of Eurasia for awhile, that Africa had its own civilizations (but couldn't compete geographically with Europe and Asia), that the American Indians were mostly decimated by disease, and so forth. I also became more interested in real characters with real lives, thoughts, and emotions—not the superficial cardboard characters so prevalent in comics. If I ever wrote a comic, I wanted it to be like the best comics I had read—WATCHMEN, DARK KNIGHT RETURNS, SQUADRON SUPREME, CONCRETE, EL DIABLO, and more. Comics that combined larger-than-life heroism with a recognizable world that included race, religion, and politics. Then, a decade ago, I was casting about for a comic book project to work on. I knew a bit more about Indians then, and I had an epiphany. 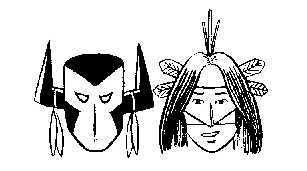 The two heroes I'd drawn looked vaguely like Hopi kachinas. The Hopi were "the people of peace." I could take my two characters and make them Pueblo-based Indians. They'd embody a Native American perspective, or more broadly, a multicultural perspective. That would set my comic apart from most comics, where the predominant themes were "might makes right," "win at all costs," and "all hail the conquering hero." As a freelance writer, I also could write articles or essays about the issues I studied. Native Americans and multiculturalism could be another area of specialization besides business and computers. My professional and creative interests could mingle to produce synergy. Hence I began brainstorming the ideal comic for my plans...as detailed in the links below. Why do a comic about Indians? Why do a comic about the Hopi?